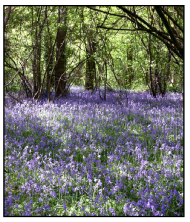 Boothland Wood - Is a lovely 5 hectare site acquired by the Town Council in 1991. It is an ancient semi- natural woodland containing a variety of venerable oak trees and coppiced species including hornbeam, hazel and ash. Access improvements have been made to steps and bridges and benches have been installed. A wide variety of interesting flora and fauna can be seen throughout the year including a fantastic display of bluebells in late Spring, grass snakes, woodland birds including nuthatches and treecreepers and a variety of dragonflies, butterflies and other insect life. The site has a rich history: evidence of old boundary banks, sunken tracks and abandoned mine pits can be seen. Bridge Farm Wood - This small piece of mixed woodland can be found alongside the old railway line. There are a number of informal stone pathways which run through the site. Access is from Bridge Farm Road. Harlands Pond - This is an old and valuable farm pond located within the Harlands Farm housing development. It has a very important toad pond and also contains population of the common frog and rather unfortunately, a great number of goldfish as well as coots, moorhens and heron, waiting to grab a tasty snack. 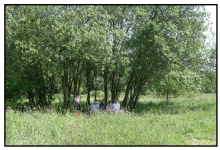 The small strip of ancient semi-natural adjacent woodland has a blanket Tree Preservation Order (TPO) on it and contains a mixture of tree species including alder and hazel. Great crested newts have been seen in the small stream which runs through the wood. Nightingale Wood - This is a small strip of ancient semi-natural woodland which can be accessed off Bullfinch Gardens. The site is covered by a blanket TPO and contains mixed species including oak, ash, birch, field maple and a significant area of hazel coppice. Wood anemones and bluebells can be seen in Spring as well as an impressive array of early purple orchids down by the stream. Hempstead Meadow LNR - This Local Nature Reserve runs alongside the River Uck floodplain and is an important wetland habitat in the heart of Uckfield and is subject to periodic flooding during the Winter months. Habitats include regularly inundated tussocky damp grassland, ditches, scrub, established trees including willow, alder, and black poplars and mixed grassland. The site supports a number of greater tussock sedges, considered uncommon in the South East. Other typical species include hemlock water- dropwort, rushes, sedges, foxtails, crosswort, meadowsweet and tansy. Fauna of interest includes grass snakes and slow worms. Bird species are variable and include snipe, sparrowhawk, song thrush and goldfinch. Insect life is rich and includes a wide range of butterflies, hoverflies, dragonflies, mayflies and beetles. West Park LNR - West Park Local Nature Reserve is of special value due to the variety of diverse habitats contained within the relatively small area of 11 hectares. These include mixed woodland, grassland (much of which is flower - rich) and a sensitive marsh which supports a number of orchid species including the rare southern marsh orchid. Wooded sandstone outcrops, home to at least 58 species of moss and liverworts, are also present here and were the site of a Mesolithic settlement. There are numerous access poi nts into the reserve which can be wet during the winter months. Sheep sometimes graze here during the Autumn to help prevent the spread of bracken and encourage delicate wild flowers to thrive. A population of dormice, a rare and protected species, has recently been discovered here. If you would like to know more about any of these sites, please contact the Town Council. Uckfield Millennium Green - Uckfield Millennium Green to the South of Uckfield off New Road, is 8.90 hectares of open space for the enjoyment of everyone. Access via Ridgewood Recreation Ground or Shipreed Lane. There is a dog-free picnic area, a pond and numerous informal paths to explore. There is an abundance of flora and fauna with the land being kept as natural as possible. You may be lucky enough to see glow worms, great crested newts, woodpeckers and numerous species of butterfly. Selby Meadow - Selby Meadow is a community space created on land saved from development. There is a large assortment of wild flowers that were planted to attract the butterfly population, there is also a bug hotel, hedgehog house, toad abode and bird boxes to encourage the local wildlife to visit. There is a pathway through the meadow which can be accessed through a gap between Oakley Court and 48 Selby Road.